The UNIX Kernel Source Tour! Hello, hackers. Welcome to The UNIX Kernel Source Tour! Feel free to browse this tour freely - it is all free and open source. Please don't download the whole hypertext using hypertext copy tools. Our network cannot afford such traffic. Instead, you can generate a thing equivalent to it in your computer using GLOBAL source code tagging system . Linux is a kernel originally created by Linus Torvalds. He began to write it since he was a student at the University of Helsinki. Now, Linux is used all over the world as part of GNU operating system. FreeBSD is an operating system of 4.4BSD origin and is well known as the base of MacOSX. The results of FreeBSD in large-scale site such as Yahoo are assessed high. UNIX V7 is ancient true UNIX operating system in 1978. The first version of UNIX is created in 1969. 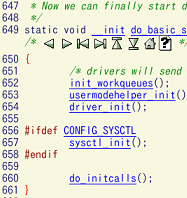 However, we assumes V7 as a completed appearance of initial UNIX. It is also known as the last ancestor of BSD and SystemV. 4.3BSD is a modern UNIX operating system distributed by University of California at Berkeley in 1986. TCP/IP was introduced into the UNIX world for the first time by 4.2BSD which preceded 4.3BSD. This operating system brought Internet all over the world. 'UNIX Kernel source tour!' was generated by GNU GLOBAL . Copyright 2019, Tama Communications Corporation.